Can you keep axolotls with fish? The answer, surprisingly, is yes — you just need to choose your fish carefully. One thing to keep in mind when keeping fish with axolotls is that those long flowy gills can start to look like food to just about any fish who’s hungry enough. Make sure to keep your fish well-fed, and be ready to separate them if you notice that your axolotl’s gills are showing signs of damage. My personal success stories! These peaceful fish enjoy cold, hard, neutral pH water. In addition, they are either too fast for axolotls to catch, too big to make an attractive meal, or they reproduce fast enough that the population should be able to maintain itself. These fish sound like they could be good axolotl tankmates in theory, but I have not tried them personally, or they did not work for me, for various reasons. 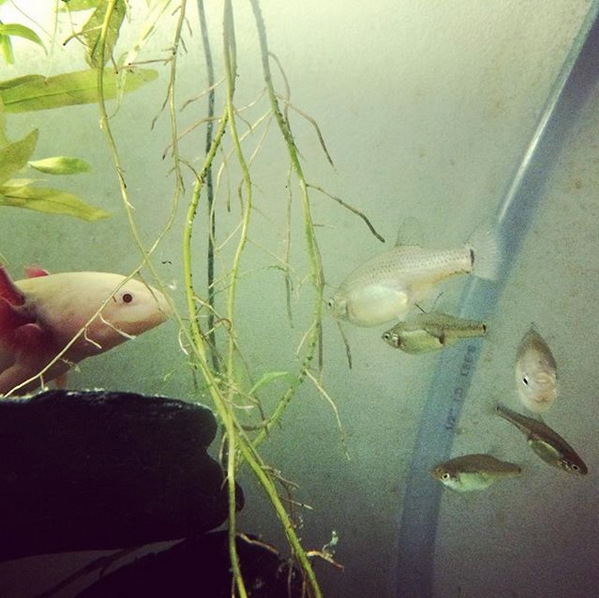 These are fish who enjoy the same water parameters as your axolotls, but are likely to become dinner very fast. If you breed them in a separate tank, they could be an attractive option as a source of cheap live food. These species could potentially be a good match, provided that you are able to maintain your water temperatures at a steady 20°C ±1°C. Do read the fish’s care requirements carefully before you make the plunge, as you may need to modify your tank setup or maintenance routine. Do keep an eye out for signs of stress in both species, and be ready to separate or adjust your setup as needed. While these fish can be kept at room temperature, they should not be kept at temperatures below 21°C for extended periods of time. These bottom-dwelling fish would infringe on your axolotl’s turf, which could lead to stress and aggressive behaviors. This includes most loaches and catfish. While these guys enjoy cold hard water, I’m not sure about their temperaments. Based on what I know of their close relatives, I would expect them to be too aggressive to be kept with axolotls. Given their precarious conservation status, it wouldn’t make sense to keep these fish in the same tank as a potential predator. These fish have a tendency to nip at flowy fins and gills, or have environmental needs that differ greatly from those of axolotls. This includes most bettas, cichlids, piranhas, pacus and sharks. I’m not including obligate brackish or saltwater fish, but it goes without saying that those would not be a good match either!